August16, 2010 -- Markham Howe, Executive Director of Public Relations for Arkansas State University and long-time advertising and m arketing strategist, has announced his retirement from the university, effective Aug. 31, 2010. Howe, who has served at ASU since 1982 as a guest lecturer and professional advisor to the Public Relations Student Society of America (1982-current), instructor in Journalism (1994-97), Director of University Relations (2002-08) and in the Executive Director position, (2009-current), has been responsible for marketing, public relations, advertising, media relations, internal/external communications and strategic communications planning for the ASU-Jonesboro campus. “I am very proud to have served the institution that I graduated from and love,” said Howe. “It has been an invigorating experience to be a part of the growth of Arkansas State University, and I’m proud to be able to close my career on a high point associated with that growth. Howe graduated from Arkansas State in 1961 with a degree in agriculture and began his professional career in public relations with Entergy-Arkansas (formerly Arkansas Power and Light Company) handling various marketing, human resources and power production positions. After spending 10 years in that capacity, he assumed the title of Little Rock District Sales Manager in 1971. He culminated a 33-year stay with AP&L as Assistant to the Vice-President of Public Affairs (1974) and Manager of Public Relations (1975-94). As part of the AP&L team, he authored the crisis communications plan for Arkansas Nuclear One, a plan that became a model for other nuclear power plants built during that time. Later, he wrote and implemented the public relations plan that resulted in a successful siting of the Independence Steam Electric Station, a major coal burning power plant located at Newark, Ark. He later worked with Mangan Holcomb and Partners as a senior public relations counsel (1996-2002), providing public relations, communications and marketing counsel to a broad range of clients before returning to ASU. 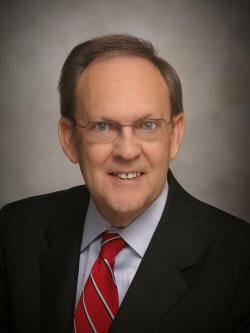 Howe’s service to ASU includes the Board of Directors of the ASU Alumni Association (2000-02) and President-Elect and Co-Founder, Friends of the College of Communications (1998-2002). He is a member of the Advisory Council to the College of Communications Department of Journalism and Printing (1998-current), and the second recipient of the Friend of the College of Communications award (2010). He also implemented a major re-branding program at the university that resulted in increased enrollment and recognition. An active member of the Public Relations Society of America (PRSA), he was awarded the Crystal Award in 2008 for lifetime achievement to the public relations profession. He has also been a member of the Arkansas Chapter of PRSA since 1977 and received accreditation by that organization in 1984. Twice, Howe has served on the Arkansas Chapter Board of Directors and is a past membership and professional development chairman. He also is the recipient of more than 20 Prism awards from PRSA-Arkansas Chapter. Along with his vast experience in public relations, Howe is active in volunteerism and community service work and has served on the boards of several non-profit organizations, including Youth Home of Arkansas, March of Dimes-Arkansas chapter, Junior Achievement of Arkansas, Retired and Senior Volunteers Program, Arkansas State University Alumni Association, Military Officers Association of America (MOAA), United Way, Special Olympics and many others. Howe served as the 1991-92 president of Civitan International, a civic club organization with approximately 45,000 members in 30 countries. He has been a member of the Little Rock Civitan Club since 1971 and served as its president in 1974-75. He was the governor of the Ozark district in 1984-85 and then served on the Civitan International Board of Directors from 1985 to 1987, representing districts in Arkansas, Louisiana, Texas, Oklahoma and Kansas. Following his tenure as international president, he has served as chairman of the strategic planning committee, chairman of the grants and scholarships committee, and is currently serving as a leadership trainer for club presidents and presidents-elect throughout the United States. He retired from the United States Army as a colonel after serving 38 years in the Army National Guard and U.S. Army Reserves. Howe will be honored at a special reception, Thursday, Aug. 26, at 3 p.m. in Cooper Alumni Center on campus. Vice Chancellor for Advancement Cristian Murdock announced that Christy Valentine, Executive Director of Development, will move to Howe’s position, which is being restructured.